Located in the Most complete full service Athletic Club in the Country, we are immersed in an active, healthy environment. A hub for the Racquet Sports, Cardio and Global consciousness, this is where we do what we do best:Â HAIR. Every type, every texture, for every individual. With a hand-picked staff of star stylists, Dions performs to the highest standard of excellence with the most advanced cutting, coloring and finishing techniques, including Bayalage Hair Coloring. We invite you to experience our 3 Minute "Drop Dead" Shampoo and Head Massage, we will consult with our client and then mix our Color using our professional opinion mixing and blending colors for your personalized color formula. Find us in the Crossover that connects ClubSport and the Pleasanton Double Tree Hotel, overlooking the Tennis Courts and adjacent to ClubSport Spa. Come for the ambience of our salon, stay for the experience, and return for impeccable service time and time again. ...BECAUSE LIFE ISN'T ABOUT FINDING YOURSELF, IT'S ABOUT CREATING YOURSELF..
Fades, Tapers, Clipper over comb! Dions opened in 1982 inside Clubsport / Double Tree Hilton. We have been providing Hair, Nail and Barbershop services to the Tri-Valley and look forward to the opportunity to serve your needs! Appointments available and Walk-ins Welcome! We recommend a quick call ahead to check availability. As a Master stylist and with over 25 years of Precision cutting experience, I am sharing the secret behind a great hair cut! How do I continue to create a great hair cut each time and every time for each of my Guests consistently every 5-6 weeks? First, have a system! Having a system allows for consistent styling from visit to visit. The system/technique we use was implemented by Gary Gerard International Haircutting. He was the pioneer of Quadrangle Style of cutting hair, with the original philosophy of creating haircuts based on a four section, systemic technique. Using a consistant system allows for the finished haircut to be the same every time. Hair cuts were shaped the way canvas is cut to stretch on a frame, as a prelude to creation. The Premier West Coast Teacher and Sylist changed hair from fabric to sculpture, using his shears to craft shapes that enhanced features without hours of setting, teasing, and pinning. His revolutionary methods changed the industry and for many stylists, allowing for a simple blowout to style the hair to a finish. His training system has been one of the most respected for 25 years. 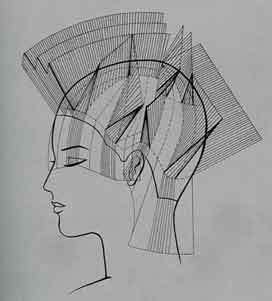 A precision haircut is a style using techniques that create straight, dramatic lines and clean angles. If your stylist ask "what number do you like?" You are most likely not in a Barber's Chair. One of the most widely used techniques for cutting menâ€™s hair, clipper over comb is a fundamental skill to master. It provides an even, consistent cut, and is ideal for removing significant amounts of hair. A variety of different finishes are possible,(Fade,Taper,Flat top etc.) depending on the size of clipper or blade you choose. The right size/number clipper blade and comb will depend on the area of the head youâ€™re working on, as well as the hairâ€™s length and texture. 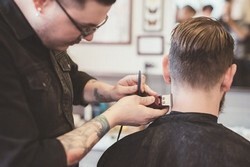 By cutting hair evenly at the exterior, a clipper over comb technique encourages hair to grow out nicely and last longer. 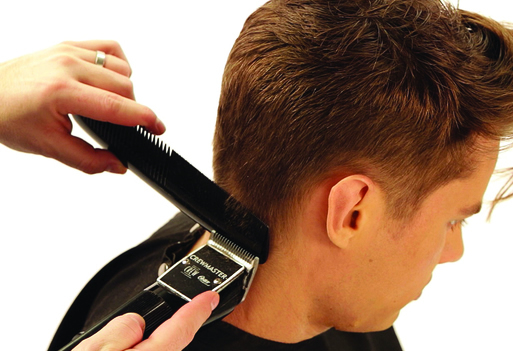 The "clipper over comb" technique also allow for a very short yet even finish of the hair. "The art of hair painting is a process that gives a more dimensional and natural looking color." Dions' Salon has been using this technique for over 20 years, with fabulous results! People often ask the difference between traditional foiling and the artistry of hair painting. Dions Salon uses a tool that is specially designed to help apply the color to the hair, leaving just the right amount. Not only is the result of hair painting far more beautiful, but it is much healthier for the hair. Aluminum foil is a conducter of heat, which almost bakes the bleach or lightening color into the hair creating dry, damaged hair. Hair Painting is a process that we teach all of our colorists at the salon. Originating in France, the word â€œBalayageâ€� translates to â€œsweepingâ€�, and the actual sweeping of color can be placed more precise and closer to the scalp. As a colorist we can place the highlight where nature intended it to be. Where as foil has it's place, we find theBalayage technique to be more modern and natural. Some of the basic steps included in a manicure are nail trimming, removal of cuticles, nail polishing, and moisturizing. While some people prefer to have their nails trimmed and nail cuticles removed, a lot prefer to have their nails polished. In fact, some are even more excited about getting their nails polished than their cuticles removed. This may sound ironic but true. Fortunately, a complete manicure process is never complete without all of these basic steps. Nails are trimmed and shaped, cuticles are gently groomed, exfoliating Scrub applied to hands and arms then a relaxing massage completes the treatment before polishing. Acrylic Power apllied gently to the shape you desire. Finished using one Standard polish color, Shellac Finish add $15. Indulge in this lush treatment for your tired feet. After nails and cuticles are gently shaped And foot smoothed to remove any inperfections, a refreshing foot scrub and hydrating Lotion are applied.The spa experience is completed with a relaxing massage and polish.. Many variations are available on request! Please call Dions' with any questions you may have. Complimentary Shampoo, detailed consultation and Haircut, finished with a Blowout and finish. A Very innovative technique allows for a creative color placement for your hair, Adding some Highlights can add definition and depth to your hair, giving an illusion of movement. Lowlights can take Highlighted hair and bring life back! The vibrant line up of color are a great way to add some unique style to your hair color! 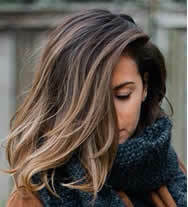 Often time we will need to pre-lighten hair to insure a bright color. These services can have a great level of variations to accomplish a dynamic finish. Call for consultation. Permanent waves continue to be a good solution for fine thin hair to help with blowout to create a full finish appearance. Moisture or strength, A treatment can help dry damaged Hair.